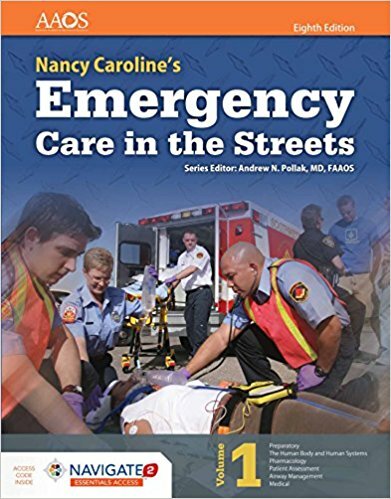 Nancy Caroline’s Emergency Care in the Streets, Eighth Edition is the next step in the evolution of the premier paramedic education program. 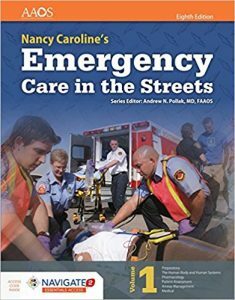 This legendary paramedic textbook was first developed by Dr. Nancy Caroline in the early 1970s and transformed paramedic education. Today, lead editors Bob Elling and Barb Aehlert, with the American Academy of Orthopaedic Surgeons, are proud to continue this legacy and set the new gold standard for the paramedics of tomorrow. The Eighth Edition meets and exceeds the paramedic National EMS Education Standards and reflects the National Model EMS Clinical Guidelines (NASEMSO), the National Registry Skill Sheets and Psychomotor Competency Portfolio, and Prehospital Trauma Life Support, Eighth Edition, from NAEMT and American College of Surgeons’ Committee on Trauma. Where applicable, the authors and editors followed additional authoritative sources, such as national stroke guidelines. Last but not least, the Eighth Edition thoroughly addresses the 2015 ECC and CPR guidelines published by the American Heart Association. These updates went beyond a compression rate or depth change; the text has been completely updated to reflect all of the Guideline changes. Career Development. Recognizing that the U.S. health care system, and the role of the paramedic in it, are rapidly evolving, we’ve added a chapter on career development. In addition to discussing the changing and expanding career opportunities for paramedics, this chapter presents nontraditional specialties that paramedics may need in the future to fill evolving roles in the healthcare system.